Earlier this month I was honored to attend the ACM Special Interest Group on Computer Science Education (SIGCSE) conference held in Raleigh, North Carolina with 1,300 other attendees. The conference attracts a dynamic and diverse group of students, educators, academics, and industry professionals who are all working toward stronger computer science education. This year’s theme “Teaching, Learning, and Collaborating” drove the discussions to topics such as classroom presentation technologies, on-line collaboration tools, new educational techniques, as well as acquiring hands-on experience with new hardware and software (including software development environments). On Thursday evening I hosted a Birds of a Feather (BoF) session on Google Summer of Code and Google Code-in where we talked about both programs in depth and gave everyone in attendance more information in the form of flyers as well as directing them to our website. I encouraged everyone to either apply to be a student in Google Summer of Code or spread the word to students they knew that might be interested in open source software development. People streamed in and out during our session so we were able to get the word out to quite a few people at the conference. 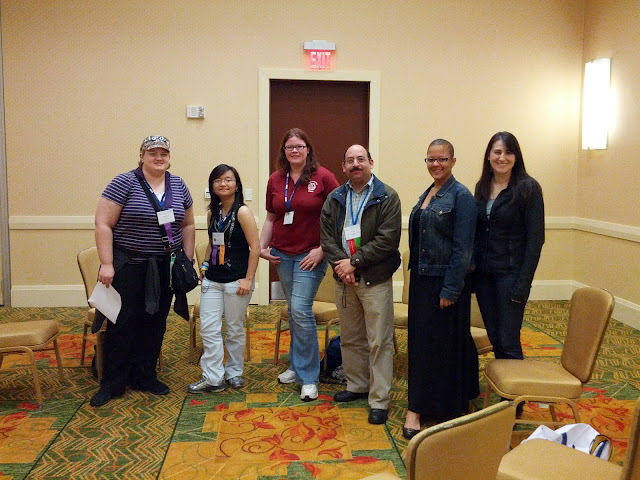 Below is a picture of a few of our attendees at the end of the session. All the people I met or spoke to were inspiring: they all were very interested in participating and spreading the word about our programs and about technology and computer science. We may have encouraged some of the students to apply to the programs, especially the Google Summer of Code which starts in a couple of weeks!